Antimahia is a traditional village in the agricultural hinterland of the island of Kos in the Dodecanese . This picturesque village lies on an arid and low plateau, upon which the island’s airport was built near the village. The village has about 2200 permanent residents, mainly used in agriculture (cereals, tobacco and sesame, as well as farming) and tourism. Antimahia or Antimachia or Andimachia, or Antimacheia (Greek Αντιμάχεια), is a site of ancient settlement whose name has remained unchanged for over three thousand years. Antimahia is at the center of the island of Kos, 23 km southwest of the capital, Kos Town . 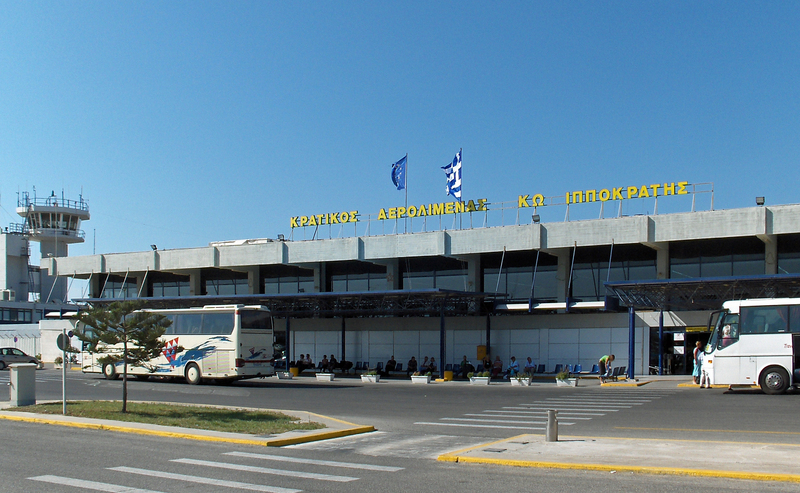 Due to the proximity of the airport, Antimachia is a road junction with links to Mastihari north to Kos northeast towards Kefalos southwest, and to Kardamena southeast. At 4 km north of Antimahia, is its port, Mastihari , which allows maritime links with the island of Kalymnos. Frequent buses connect Antimahia Kos via Mastichari. "House of Antimahia" is a traditional early twentieth century was transformed into a museum. You can see the typical closed-beds that were installed in order to store up below the olive harvest and wine. 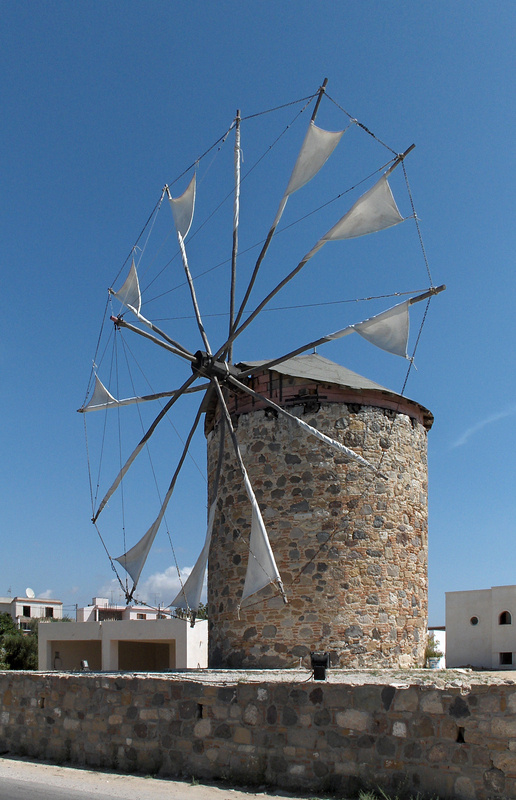 In front of the "House of Antimachia" is a traditional windmill, called the "Mill Pope" (Mylos tou Papa). The last miller died in 2005, the mill was converted into a museum, it would be the last working windmill on the island of Kos, in a state with its wing. You can visit the interior and observe its mechanism. 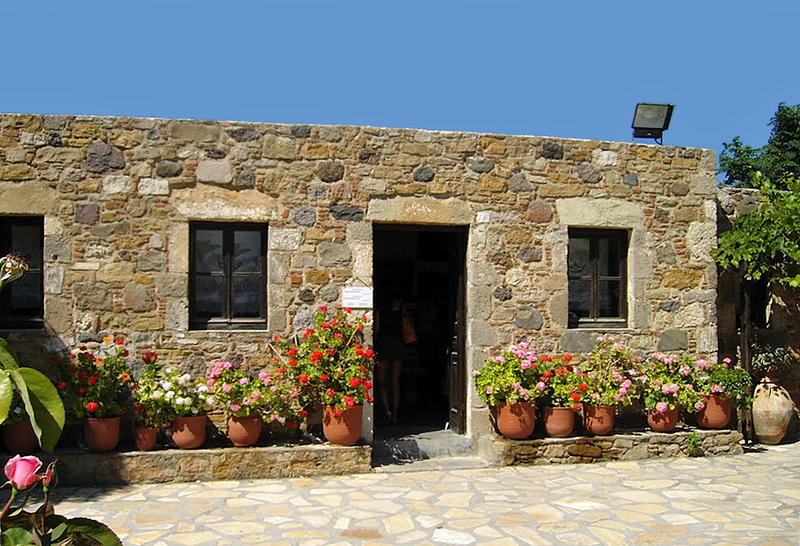 Visiting hours: 8 am usually 30-17 h.
Castle Antimachia (Greek Κάστρο Αντιμάχειας) is located on the south side of the island of Kos , in the area of Kardamena : the immense fortress is situated on a hill 170 m above sea level and dominates the center of the island, it faces the island of Nisyros in the south. The castle is located 3 km east of the village can be reached by a paved road, well marked and in good condition, which starts just before the village of Antimachia when you come to Kos . Access to the castle is free Antimahia. 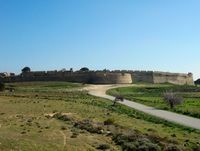 According to the archives of the Order of Malta , the fortress was built Antimahia by the College in the early fourteenth century, from 1337 to 1346, under the teaching of the Grand Master Helion de Villeneuve (1319-1346), to the location of a small Byzantine castle oldest. The fortress underwent different uses, depending on the circumstances of the times. From 1383, by decision of the Council of the Military and Hospitaller Order of St. John, the castle was used as a prison for the Knights Hospitallers who had behaved badly, from the middle of the fifteenth century, it seems that the castle became a fortified town. The constant attacks of the Ottoman fleet and pirates in the fifteenth and sixteenth centuries, led to several residents of the island to take refuge inside the castle, considered one of the safest Order castles . During the attempted invasion of Kos by the Turks in 1457 (156 ships, 16,000 soldiers) Antimachia Castle, together with the castles of Paleo Pyli and Kefalos , served as a refuge for the 12,000 inhabitants of the island Kos, the Turks were eventually repulsed by the Knights Hospitaller, helped by the people of Kos, after 23 days of fighting. The most serious fortification began only in 1490, at the same time as the castle Neratzia in the city of Kos, in the magisterium of Pierre d’Aubusson (1473-1503). At the entrance of the castle, we see carved crest - with cardinal’s hat - the Cardinal Grand Master Pierre d’Aubusson, with the date 1494. The castle gate, north-west - which was a double door - was protected by a large bastion shaped horseshoe is the work of Grand Master Fabrizio del Carretto (1513-1521); Carretto built such bastions also Neratzia Castle in Kos and the Grand Master’s Palace in Rhodes . 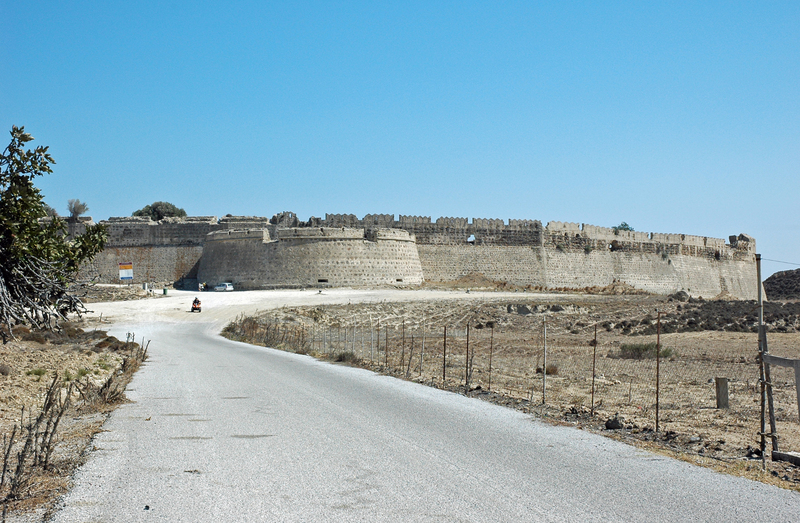 After the fall of Rhodes in 1522, the fortress fell to the Turks, as the entire island. During the Ottoman occupation, a mosque was built inside the castle was destroyed. The mid-nineteenth century, the inhabitants abandoned the castle and headed to the north of the island and south towards the sea, creating two new villages, and one of the Antimahia of Kardamena . The earthquake of 8 February 1926 and 23 April 1933 destroyed many buildings inside the fortress walls but resisted. The castle is a fortress of the Knights of irregular quadrilateral-shaped, large enough to accommodate the population of the region, with a total area of ​​45,000 m². The fortress was built with volcanic boulders. 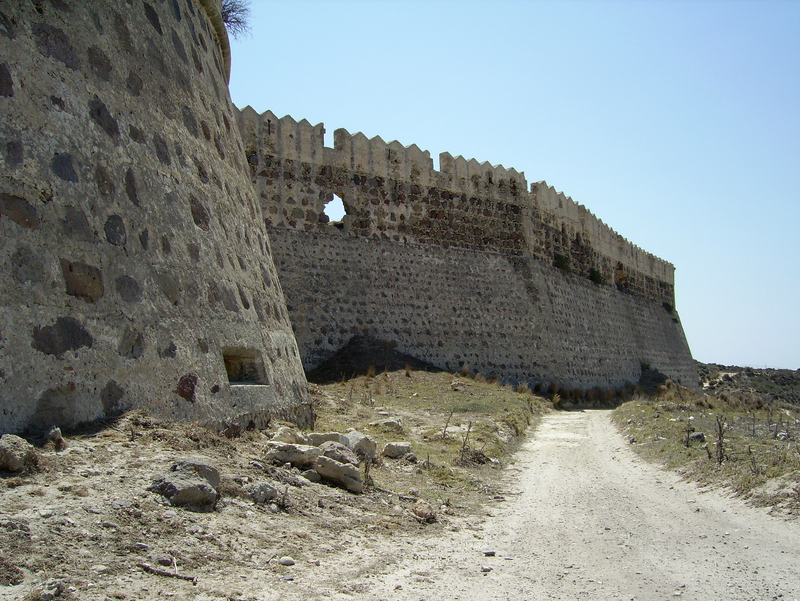 The walls were strengthened especially in the lower parts of the north, while the south side, in the direction of Kardamena, the castle took advantage of the natural protection of the steep terrain. A path allows you to turn out the impressive city walls, 970 m in length, that hug the top of the hill and are well preserved. Once penetrated inside the fortress by the imposing gate to the north, it is possible to follow the path round to the west, also well preserved. Many buildings that were inside the walls to accommodate the refugees, there remains only the foundations of houses and the ruins of some warehouse. In contrast, several tanks are still visible and two chapels were restored: the Saint-Nicolas and the chapel of Agia Paraskevi. You can also see the remains of a third chapel of Panagia Eleimonitrias(Παναγία της Ελεημονήτριας). Concerts are held occasionally, inside the fortress. The castle of the Knights overlooks the Strait of Nissyros south of the island of Kos. The fortress, the view extends to the Turkish peninsula Knidos (Cnidus), south-east, and the island of Nisyros volcano and south, and farther on the horizon, Tilos. The fortress is visible from the ferry that connects to Kos Nisyros. The chapel of Saint-Nicolas (Agios NikolaosΆγιος Νικόλαος) is a Byzantine church post the fourteenth century. It houses, in the apse, an interesting fresco of St. Christopher (Ayios Khristoforos) carrying the child Jesus. The facade of the chapel has three emblems, including the Grand Master del Carretto with the year 1520, which were introduced later. The Chapel of St. Preparation (Agia Paraskevi,Αγία Παρασκευή) dates from the eighteenth century (1705), it has an elegant arch rib. Plaka forest is a green oasis on the central plateau of the island of Kos and is located west of the airport Antimahia. It is a popular picnic: the forest is known for its wild peacocks who live there, and for its sunsets.